Yes, I’m about to give props to Goldman. Deal with it. 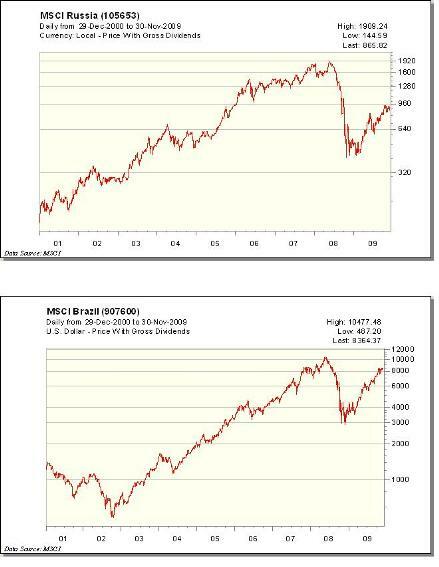 The single biggest, most profitable market call of the last decade was made in 2001 by economist Jim O’Neill, then working at none other than Goldman Sachs. The call was made in Global Economics Paper #66 aka “Building Better Global Economic BRICs” and it marked the original usage of the term “BRIC” to describe Brazil, Russia, India and China as a group. The coining of the term is secondary to the trillions in wealth and world-changing shifts that this paper predicted. Had you heeded O’Neill’s work and gotten invested in the stock markets of those four nations, you’d have made more money this past decade than by doing virtually anything else conceivable. Over the next 50 years, Brazil, Russia, India and China—the BRICs economies — could become a much larger force in the world economy. Using the latest demographic projections and a model of capital accumulation and productivity growth, we map out GDP growth, income per capita and currency movements in the BRICs economies until 2050. The results are startling. 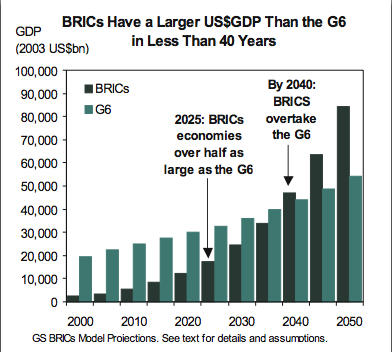 If things go right, in less than 40 years, the BRICs economies together could be larger than the G6 in US dollar terms. By 2025 they could account for over half the size of the G6. Currently they are worth less than 15%. Of the current G6, only the US and Japan may be among the six largest economies in US dollar terms in 2050. This call was bigger and more prescient than any I can think of this decade. It literally encompasses every major theme, from currencies to commodities, from the cost of technology components to the price of a barrel of oil, from the exchange rate of the dollar to the growth rate of the global middle class. As far as percentage gains, in some instances, we’re talking about thousands of percentage points in whole indices! 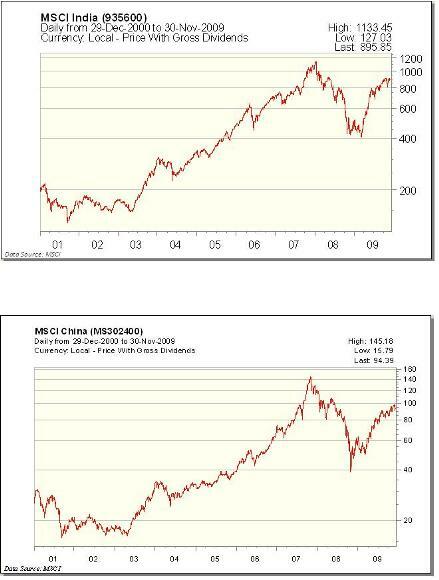 Congratulations to Goldman Sachs for nailing this story back in 2001 and to anyone who got in and rode the BRIC trade this decade. From where these markets stand today, even after the Credit Crisis, O’Neill’s original paper is starting to look like a once-in-a-lifetime call.